The Recession of 2008 is brutally devastating to many Americans. However, those that lost their jobs and homes and are forced to live on the streets are the ones hit the hardest. And it’s not over yet! This economic crisis is like a giant monster tailgating us but whose shadow goes so fast ahead of us that playing catch-up with the economy seems like an exercise in futility. As increasing poverty continues to beleaguer all of America, how can the Church get involved? Can this crisis become an opportunity for the community of believers to shine “like stars in the world” (Philippians 2:15)? What does it mean to be “the light of the world” (Matthew 5:14-16) in a world which is also the world of the poor and the homeless? That’s what we are going to find out in CITY ON A HILL. I will specifically look at the rising problem of homelessness in the Las Vegas Valley: what actions have been done to solve it and why some solutions have not worked or not applied. 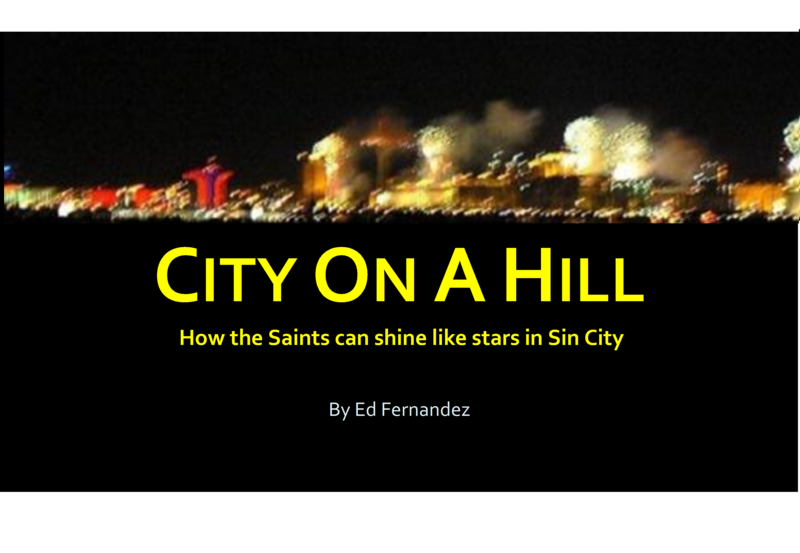 Then I will propose a solution that the larger community of believers may find worth “gambling” their resources on because, if it is going to work, the saints will definitely shine like stars Sin City!